Great choice. I heard it dubbed in German when it came out - still was an excellent film though. I always wondered if hearing the original Italian would add another dimension to the film. It was a wonderful movie. I never dreamed that a film about a concentration camp could be joyous -- but this one was, and without trivializing the horror of the camps. Roberto Benigni is an amazingly expressive actor, and I think the Italian language itself suits the film much better. Besides, it's worth a second viewing anyway, as some fellow TOCers and I discovered last night. A great movie. Robert Benigni should skip politics and stick with acting. is an imitation of the famous italian actor, Massimo Troise, who directed the movie "Il postino"
Massimo Troise was from Naples Italy (I am from Naples too) and he was a good friend of Benigni. Benigni is very expressive ,but all communists are, pay close attention to his humor and you will realize how anti american he is. A fable on the dead of so many men means to write one day something funny on the atomic bomb. This beautiful movie made me cry, and I felt it deserved an Oscar. I agree that this movie was a wonderful and special thing. 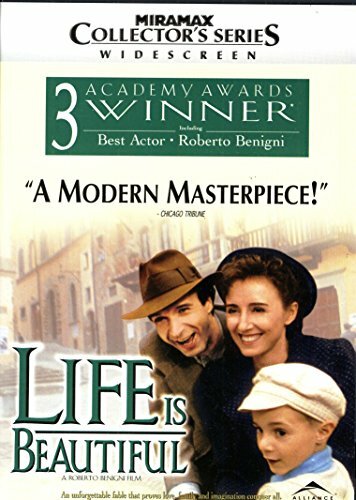 The title "life is beautiful" captures the sense of life the movie portrays on multiple fronts: the conquest of evil, the winning of the mate one wants who responds to being yourself, and in the effervescent spirit of the character portrayed by Benigni. Life is beautiful if you choose to focus on and live surrounded by the beautiful parts. You don't forget this one. It's really a great love story. I found the resolution at the end to be completely overwhelming, emotionally. It was such a masterful integration and conclusion of the story and so warm and life affirming that I was nearly sobbing in the theater.